When I sorted through my clothes a couple of weeks back, I came across several little cardigans and jackets which I made several years ago. Bolero-like, waist length or shorter, often open-fronted and in many cases with short sleeves, these were among my early successful pattern making experiments. I don't remember why I sewed jackets to that scale back then but they were good practice. I used to wear them with skirts or trousers, layered over a RTW cotton turtleneck. In the past years, my style slightly shifted and they got worn less and less but I still like them. So, I would need something designed to go with them. I decided on a dress from a pointe knit. To make sure it would go with the whole collection, I kept it really simple. And I wanted long sleeves. 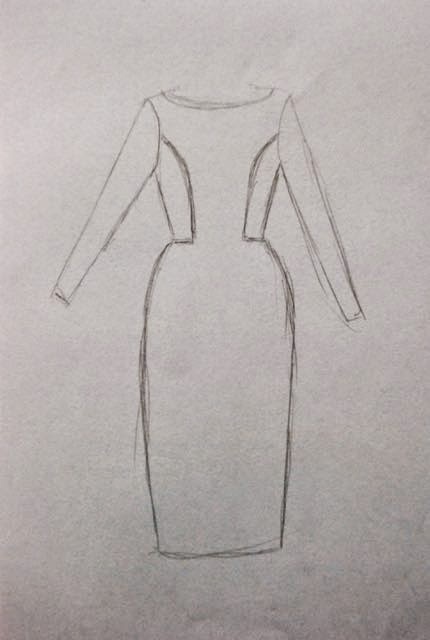 You can see the actual style lines better in this sketch (although the dress has a simple straight skirt, not a tapered one). At first, I wanted to use black fabric, but the piece in my stash was smaller than I thought. Instead, I used this grey pointe which was left over from the pair of trousers I made for my mother a few years ago. The fit of the dress is quite good but I wasn't thrilled with the dress itself. I even considered to chop half the skirt off to a very unusual-for-me 1980's kind of length which might yet work when worn with thick tights. However... I didn't make this dress to wear it on its own. It was made to allow me to enjoy wearing my little jackets and cardigans again and I really like how it looks with those! These are just two of them. There is another off-white cardi with three-quarterlength sleeves, a bolero with a snap at the waistline in tweed knit and two long sleeved waist length jackets (which I may prefer to wear with a sleeveless dress instead). It may be a bit late in the season for this particular wardrobe addition but I think it will definitely serve its purpose. This is a really wonderful, basic piece. I really like it as it is. Great shape including the length and perfect for your jackets.